Time’s up. They had their chance, now they have to take the stick for not doing the right thing. Hit-and-run tactics seem OK for these climate alarm propagandists, who so far have preferred to ignore the inconvenient truth. 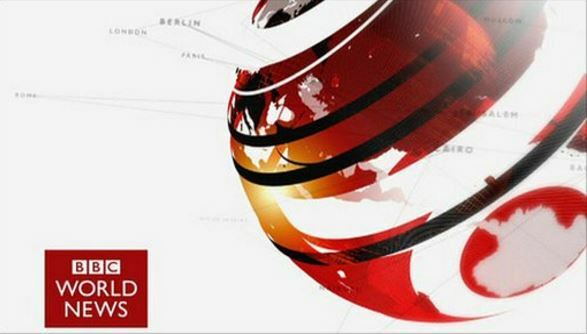 Update 1: the BBC has reacted, a day after the GWPF complaint piece and a week after the errors were reported in the US press. Update 2: the BBC has overwritten the original story with their new ‘concerns’ article, reports The GWPF. So they’ve buried the fake news. Mainstream media is silent on errors in flawed climate scare story, says The GWPF. 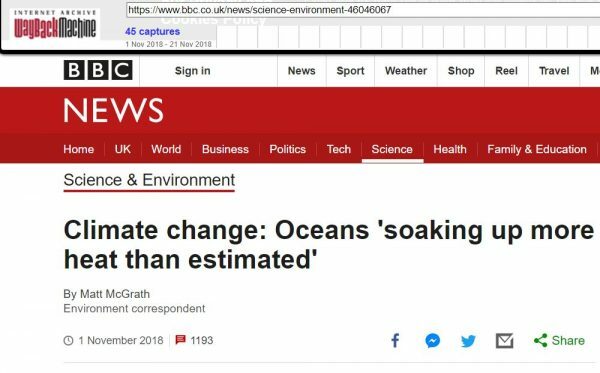 London, 19 November: The Global Warming Policy Forum today slammed the UK media for its failure to tell readers about errors in a widely reported global warming story. Media outlets around the world reported new findings that suggested that the world’s oceans were warming faster than previously thought. However, within days serious errors were found in the underlying scientific paper, prompting its authors to issue a correction. Several newspapers in the USA, including Science magazine, the Washington Post and the Washington Times have published follow-up stories, outlining the discovery of the error, which entirely negates the earlier headlines. To date, no UK newspaper, nor the BBC has reported the story, or even issued a correction. By failing to report these developments and setting the record straight, the BBC is breaking its own guidelines on corrections. The heading of the original version of the BBC report, no longer available on their website (this copy from The Wayback Machine). UK media shows itself as weapons grade propaganda generator. Fake news from fake journalist who can not even impersonate being reporters that are cool, calm, dispassionate, unemotional, and just reporting the facts as seen and where possible verified. The BBC has not reacted with integrity. The updated article is not conspicuous from the sci./env. page and the subject of saturation news coverage as per the original, original comments are present, but no more allowed. Of course, they’ve all been shown up by over-promoting a dud without any note of caution. All part of the climate alarm confirmation bias they carry around all the time. The headline is now: Climate change: Concerns over report on ocean heating. The article makes no sense without the original. At its end it contains an unnecessary self-serving, “UPDATE: The original version of this story was published before the errors in the study came to light.” The comment about the large uncertainties in the data by Thomas Froelicher that was present in the original article has been removed. Shome mishtake, shurely? – as Private Eye used to say.